The couta boat has come to be an icon for maritime Victoria, and has certainly become an undeniable part of the mix that identifies our state – these wooden sailing boats are so widely viewed as such that a fleet of them were even made an integral part of the river event of the opening ceremony of the Commonwealth Games in March 2006, and helped showcase Melbourne to the world. 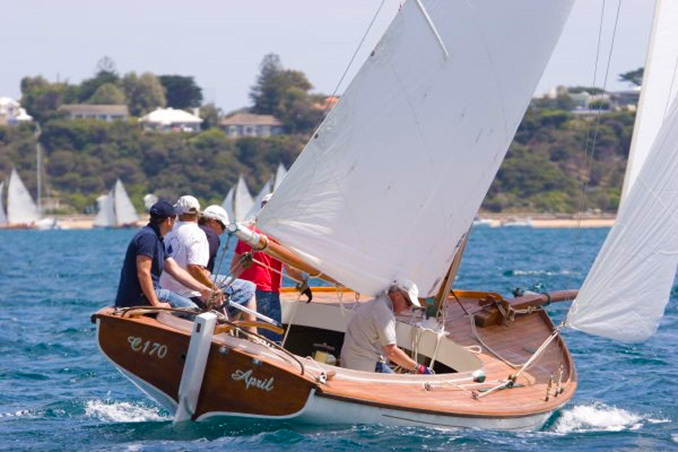 These gaff-rigged, timber-built sailing craft can usually be spotted at the southern end of Port Phillip over summer, mostly around Sorrento and Queenscliff, although couta boats can turn up in all sorts of places along Australia’s coast. Originating from working fishing craft of the 1800s, the couta boat became a victim of the modernisation of the fishing industry after the Second World War, and only survives today due largely to the efforts of a small group of individuals with a keen sense of history and admiration for working maritime traditions. Regretting the apparent inevitability that these distinctive boats would be relegated to the status of a forgotten footnote to Australia’s seafaring history and vanish into obscurity, a few dedicated people sought out and restored, from the late 1970s onwards, the remaining original couta boats that were either still afloat or propped up in backyards along the coast. Before their renaissance, some were destined for the tip, and one even had to be rescued from a bonfire. Pivotal to the modern-day resurgence of the couta boat has been boat builder Tim Phillips (pictured above on the left). He is committed to the preservation and restoration of wooden boats and boat building skills, and his Wooden Boatshop at Sorrento, initially a purpose-built site for fixing up old couta boats, has evolved to a complete facility for wooden boat maintenance, restoration and construction. Phillips still builds boats in the age-old way in timber, and makes them to standards, and by the methods, that have been passed down through craftsmen and fishermen from the hey-day of the couta boat era. Initially a one-man enterprise, the Wooden Boatshop now has a staff of more than 20, and teaches the traditional skills of wooden boatbuilding to a new generation through an apprenticeship program. Coercing otherwise straight pieces of timber into the sweeping curves of a sailing boat, and fitting them together well enough to keep the water out, is a skill not very common today, and yet staff at the Wooden Boatshop are kept busy all year building not only couta boats but much larger motor launches, which are developed from the very seaworthy couta boat hull type, as well as smaller dinghies. But it is the iconic couta that is a steady guest in the yard, either a new one being built or several that are in for maintenance or refinements. Looking at the rough sawn flitches of timber stacked at an end of one of the site’s large sheds, it is hard to imagine these thick slabs of wood being turned into the finely fashioned, beautiful curves of the timber sailing craft resting lightly on a neat row of blocks at the other end of the same shed. One could almost envisage that the only thing needed at the Wooden Boatshop is a forest next door to supply its raw material. But it is that fact, that he is competing successfully with the mass-production market, that is most impressive. Phillips’ one-man show has developed into a commercially viable business that consistently builds only in timber and competes fair and square with modern production concerns. It has all only been possible by Phillips’ determined effort to get back to a point in time when fibreglass and aluminium were not the first choice for boat construction. He has gone back to where the old timers left off, as it were, and restarted the evolutionary process that had been interrupted for decades. Fellow senior boat builder Mark Abbott, who developed their latest luxury motor launches, says: “It has made a viable industry from something that was forgotten really – that had been left behind.” Although the methods and materials of construction have been a continuation of a tradition that was abandoned, they are committed to the best of technology as far as engines and so on are concerned. “Here we’ve got a boat that is really unique in its traditional construction, but is modern in every other aspect,” Abbott says. So while there is no carbon fibre and the boats are made of wood, and use wooden blocks (pulleys), the couta boat is not lost in a time warp — there is no need for canvas sails, as the original boats had of necessity, and they all have an engine. 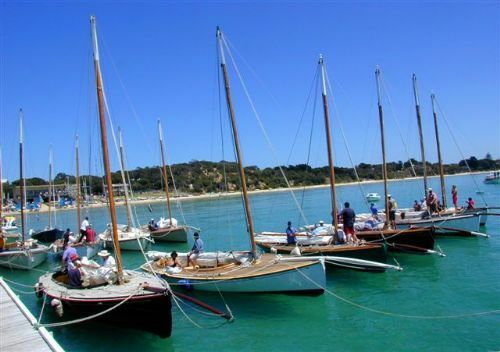 There is of course no tampering with historically significant boats, such as the restored couta boats Thistle and Patsy, respectively displayed in the National Maritime Museum in Sydney and Museum Victoria. And knowing every piece also means that if any part of a couta boat needs replacing, it can be done with little fuss. A wooden boat could almost be called the ultimate sustainable vessel – parts can be replaced as needed, and the raw material grows on trees. 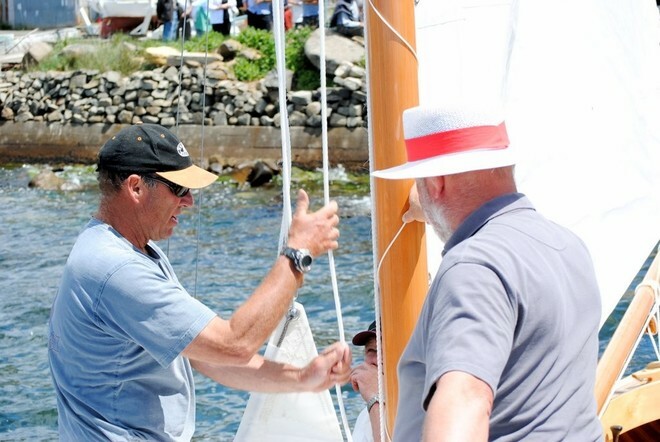 The longevity of a well-maintained couta boat is undeniable; many are still going strong more than 60 years later, which will be a feat modern boats will struggle to match. Vaughan McGillivery has one year to go on his apprenticeship. The 19 year old says: “Tim encourages us to stay on, and there’s definitely a job here for me. And that’s great. More boats are being ordered all the time, and we’re all happy that the work keeps turning up.” Standing next to a brand-new huon pine couta boat, chisel in hand, he adds, “Tim gave me this boat to work on”, like it was a gift, not a chore. Certainly the cost of a couta boat can limit ownership to either those who can afford it, or to the more affected enthusiast who may dedicate more time and money than they should to their passion. To have a new couta boat built, with all you need to sail away, will set you back around $110,000, so these days the hand on a couta boat’s tiller will more usually belong to a successful professional than a humble fisherman – people like Amcor chairman Chris Roberts or Max Beck of property developer Becton. Eddie McGuire and ex-federal treasurer Peter Costello were sailing couta boats last summer. The couta boat developed for the coastal fishing industry over the later part of 1800s. Fishermen chased such sought-after fish as barracouta (hence the name “couta boat”) but fishing co-operatives established quotas to control prices, and it was this that lead to the added requirement of speed in a good fishing boat. The boats would head out to the grounds before dawn, most often out through the entrance to Port Phillip, the infamous and often treacherous Rip, which is where the couta boats’ qualities of seaworthiness were proven. Once their quota of barracouta was met, the fishermen turned their efforts to sailing back to port as fast as they could — the first boat back got the best prices. So while load carrying capacity was important, the need for speed under sail was also a sought-after characteristic. In fact, a rig peculiar to the couta boat evolved, which allowed for sail to be carried a lot higher than was usual at the time, and included the distinctive curved down bowsprit. As an efficient and competitive commercial fishing vessel, the couta boat reached its peak around the 1920s and 1930s. After the Second World War, the development of engines and the public’s growing preference for shark started to push the couta boat from centre stage. But this working fishing craft’s perfect compromise between seaworthiness, speed and capacity has made it today a quintessential recreational sailing boat. This article first appeared in the Herald Sun’s “Weekend” magazine.